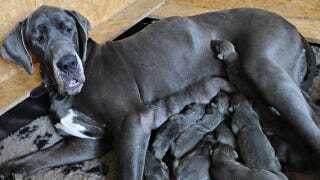 On Monday, a Great Dane named Hania gave birth to 17 puppies in Poland. Hania's owner Gabriel Kubalska is working to help her feed the eight male and nine female pups. "She had to have a caesarean section and she is feeling fine now, but isn't able to feed them all so I help out. It takes half an hour to feed them all — six times a day," says Kubalska. As you may recall, a German dog also gave birth to 17 puppies in December. For a real cute overload, just picture the two families rooming together in a canine version of The Brady Bunch.